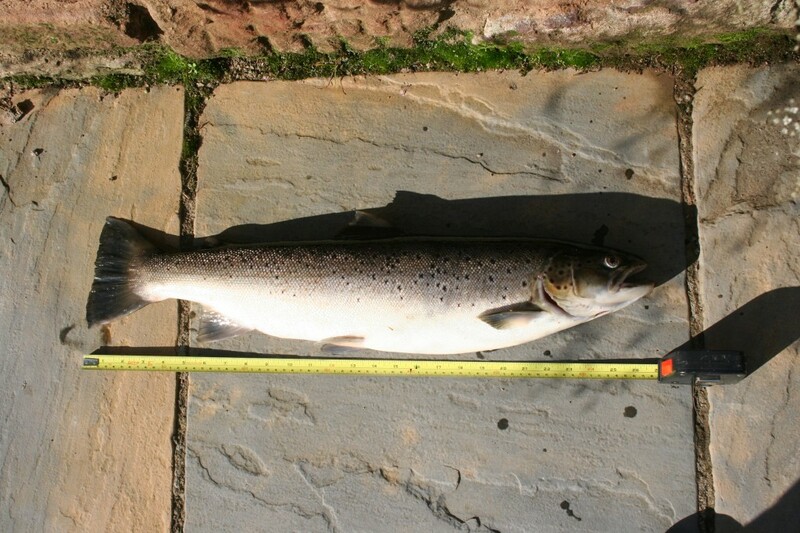 Stop Press – An 8lbs hen sea trout in excellent condition was caught on Saturday 29/8 in the tail of Indies Pool. This beautiful fish is the second largest sea trout from Finavon in nearly 140 years of records. If fish are able to live long enough to grow to this size, and during their lives return many times to the river to spawn, there must be something going right in the environment! The important thing about this fish is its condition: I have not seen a better fish than this one, and it fought as well as a salmon of double its weight. We normally would not kill a sea trout of this size (the best sze for eating is 2lbs to 3lbs) but it was badly hooked in tghe gills and was bleeding profusely, giving it no chance of survival. Reluctantly therefore I despatched the fish. This was Meant to be a Dry Season! This was meant to be a dry season, according to long range forecasts. It has turned out to be the complete opposite! 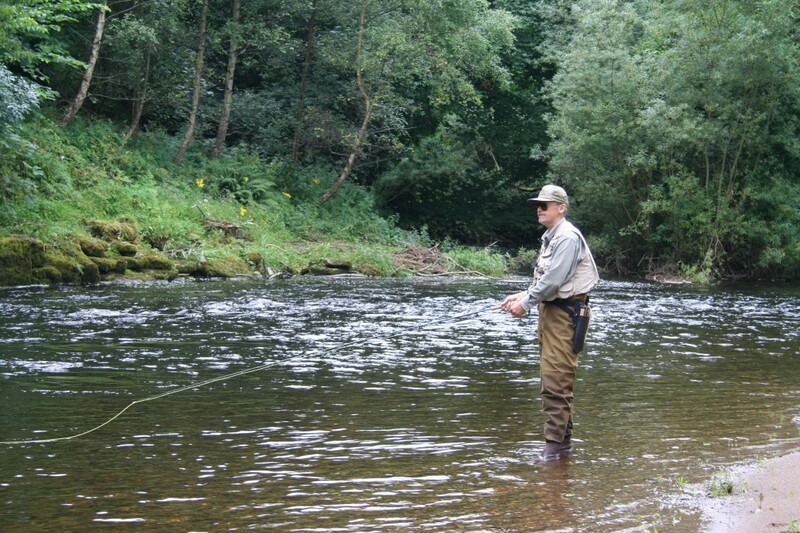 We have had steady rain throughout August and, as I write this towards the end of the month, the total catches for the season are Salmon pushing towards 60 and sea trout just under 100. 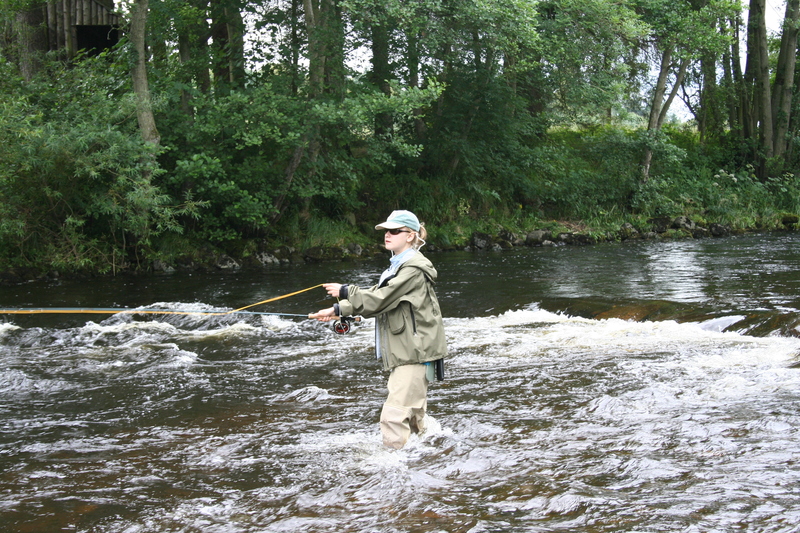 A feature of 2009 has been the number of large fish showing in the pools. In July and August five salmon of over 20lbs were hooked and lost, one of them at the net in the presence of Moray Macfarlane, who couldn’t stretch his hand around the massive wrist of the tail! I can vouch for this trend in big fish because last night (27/8) I was fishing the Willows at dusk when an absolute monster of a fish leapt clean out of the water in Upper Boat Pool. It was about 30 yards away and I estimate it as quite a bit more than 20lbs. The fish I caught a few minutes later was a nice clean grilse of 6lbs. When it took my fly (a size 6 Finavon Whisp) there was a heart-stopping moment as the line tightened when I thought I was into the big fish. Never mind: a salmon is a fish no matter how much it weighs! Prospects for the last two months of the season (closes on 31st October) are promising, especially if we continue to see big salmon. The river is in perfect condition and, although we are seeing only a few fish (I saw 6 in 2 hours fishing last night) my guess is that the river is well stocked. The nets come off on 31st August, so there will be nothing to prevent new fish entering the river. We still have a few days left in September, and fewer still in October. Posted in Fishing Report, River Report, Salmon | Comments Off on This was Meant to be a Dry Season! Water conditions have been perfect over the last week and we have caught some nice two sea-winter salmon, with Andrew Bett catching and releasing a 17lbs fresh fish in Marcus House Pool. After the excitements of the previous week when Simon Walter lost two double figures salmon in Boat Pool and Tollmuir Pool (We think both were closer to 20lbs than 10lbs) we ended up on the last day of July with a respectable 45 salmon for the season to date. If we get water and fish the catches should rise quickly from now until the close of the season at the end of October. As far as sea trout are concerned we have had 79 for the season so far and there are no shoals of sea trout or fresh run fish to brighten things up. At the rate things are going I think we may struggle to reach our five-year average for sea trout this season. As I write this update on 3 August the River is in excellent ply and big fish are running through but not in any great numbers. The grilse have not yet appeared but with more rain forecast I expect this to change in the next few days.